For a limited time only, there's a great deal on select Blu-ray digibook titles at the WB Shop! Warner Brothers is selling a variety of their Blu-ray digibooks ranging from $14.95 to $17.95 (36% to 46% off). 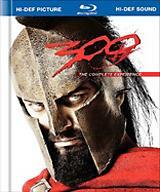 Some highlights include '300: The Complete Experience,' 'The Green Mile,' and more! Click here to browse the entire selection of titles available and complete your digibook collection while you can for a great price! This offer is not combinable with any other offers and expires on June 13, 2011.